Dunkin’ Donuts is celebrating the return of fall with a harvest of delicious donuts. 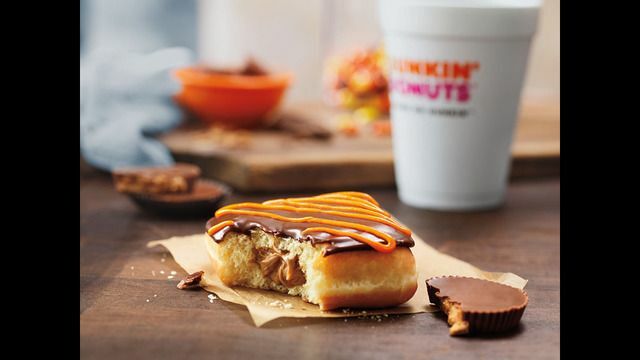 Dunkin’ Donuts is once again putting the tastes of creamy chocolate and REESE’S Peanut Butter together in one tasty treat with the return of the REESE’S Peanut Butter Square. For a new sweet autumn treat, Dunkin’ Donuts fans can also enjoy favorite fall flavors of caramel and apple with the new Caramel Apple Croissant Donut. A creative twist on the classic candy, Dunkin’ Donuts’ REESE’S Peanut Butter Square is filled with rich and creamy REESE’S peanut butter buttercreme, topped with chocolate icing and finished with an orange icing drizzle to match the colors of the traditional REESE’S Peanut Butter Cups. The Caramel Apple Croissant Donut is a glazed croissant donut with apple filling, finished with caramel icing drizzle. Both items will be available for a limited time beginning today at participating Dunkin' Donuts restaurants. Dunkin’ Donuts’ prime pumpkin lineup has also returned to its restaurants nationwide today, with pumpkin flavored coffees, lattes, macchiatos, donuts, MUNCHKINS® and muffins. Dunkin’ Donuts’ entire autumn array offers one of the largest varieties of pumpkin choices of any national restaurant chain, available all day long. In addition to classic pumpkin, Dunkin’ Donuts is offering a new way for coffee lovers to satisfy cravings for fall flavors, introducing Salted Caramel flavored coffee, lattes and macchiatos, also now available for a limited time at Dunkin’ Donuts restaurants. Served hot or iced, Dunkin’ Donuts’ new Salted Caramel flavored coffees combine sweet and salty in a delicious blend for fall. Beginning today and continuing through the end of the month, Dunkin’ Donuts also has a new, special offer making it easy for coffee lovers to enjoy an afternoon espresso beverage. From 12 PM to 6 PM each day at participating Dunkin’ Donuts restaurants nationwide (and until closing at participating locations in the Northeast) guests can purchase a medium hot or iced espresso beverage for the special price of only $1.99. Guests can customize their latte or macchiato with any sweetened coffee flavor swirl, including seasonal flavors such as Salted Caramel or Pumpkin. Dunkin’ Donuts’ newest breakfast sandwich selection, the Belgian Waffle Breakfast Sandwich, is available for limited time beginning today as well. The new Belgian Waffle Breakfast Sandwich features Cherrywood smoked bacon, egg and American cheese served between two thick, deep-ridged Belgian Waffles, golden brown on the outside and fluffy and light inside for a scrumptious and satisfying sandwich served any time of day. To celebrate Dunkin’ Donuts’ winning waffles, the brand has launched a new mobile game. “Savor the Flavor” Instant Scratch & Win Game features a virtual waffle-themed scratch card, giving fans a daily opportunity at winning Dunkin’ Donuts mGifts through September 30. Two lucky grand prize winners will receive one year of free Dunkin’ Donuts breakfast sandwiches. No purchase necessary, 18+ to participate. To play the game, and for official rules and additional information, visit: http://www.ddsavortheflavor.com/. Finally, for fall brew-at-home options, Dunkin’ Donuts Pumpkin flavored K-Cup® pods and packaged Pumpkin flavored coffee are available at participating Dunkin’ Donuts restaurants as well as online at http://shop.dunkindonuts.com. Additionally, new Pumpkin Spice flavored packaged coffee and K-Cup® pods are available at grocery stores nationwide for a limited time only.